I’m truly behind in my quest for 3 versions a week for the 100 painting challenge, but still in there! I haven’t decided on any theme for some of them, but who knows how I will feel next week. This one just painted itself with wild and crazy colors! For those new to the site, the size is always 5X7, pastel, 30-minute time limit (although on this one I think I pushed that to 45 minutes). 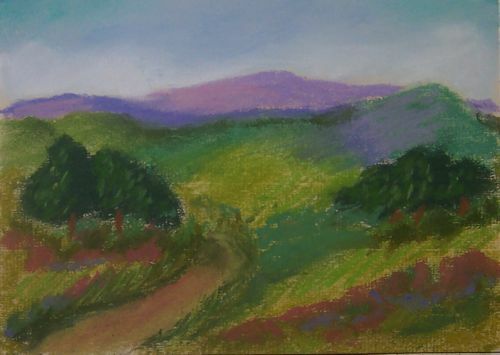 This entry was posted on Tuesday, November 24th, 2009 at 9:37 pm	and is filed under 100 Pastel Challenge, Color, Flora, Landscapes, Paintings, Pastels. You can follow any responses to this entry through the RSS 2.0 feed. You can leave a response, or trackback from your own site. Wait, is that Rock Candy Mountain? gorgeous, not wild, colors! I love what the purple mountains do for the whole picture. The purple bits in the foreground really help create the eye movement around the picture like you would wish.